I hope everyone is ready for a new AX filled week, and that you had a good weekend. 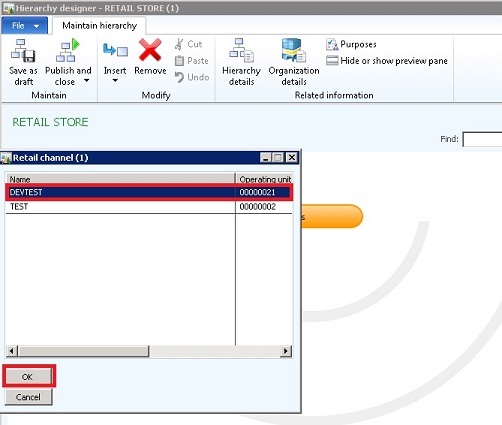 This week I have a lot of work ahead of me, but I wanted to take the time and share with you the steps necessary to create a retail store in AX 2012 Retail. The creation of a retail store requires many steps and some planning. I would like to extend my gratitude to Liam Breslin for his knowledge on this topic. He is a Senior Consultant for Junction Solutions and he specializes in Retail. You can contact him on his LinkedIn profile for any questions you might have about AX 2012 Retail. 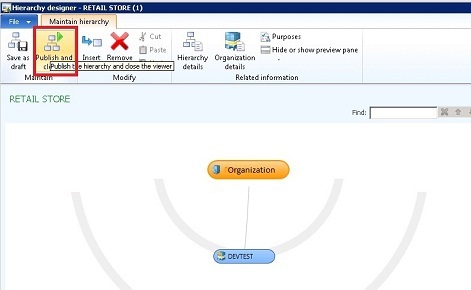 2- Click the Organization Hierarchy tab button to create a new organization hierarchy. 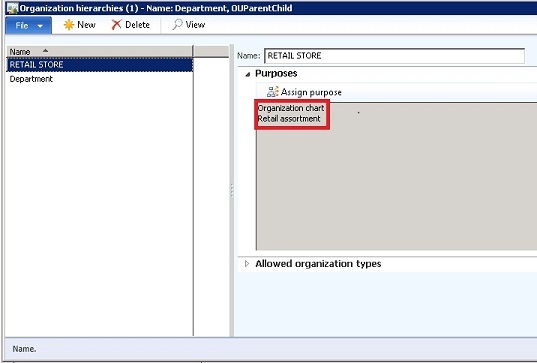 3- When the new window opens, click New and assign a name to the new organization hierarchy (i.e. Retail Store). 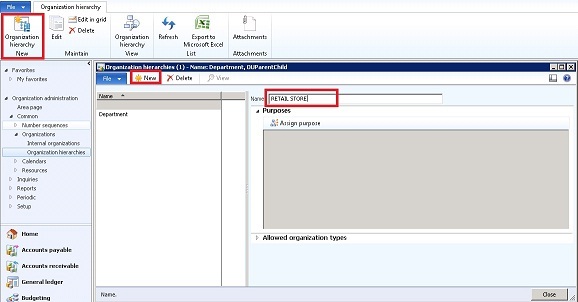 4- Then click the Assign Purpose button to open the Organization hierarchy purposes window. In here we need to link the Organization Hierarchy you just created in step 3 with the organizational chart portion of AX. To accomplish this, click the Add button to add a new Assigned Category. Once you have created the assigned category, click the Set as Default button. 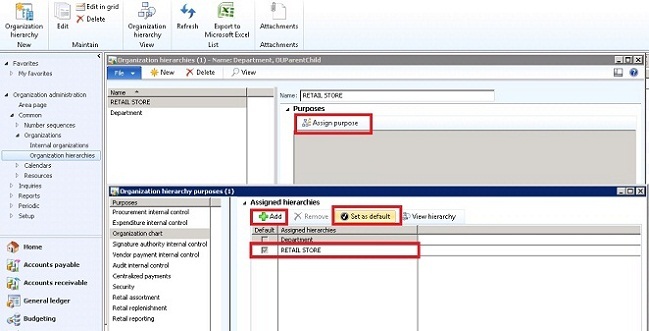 This will set your configuration as the default one to carry on later on the process. 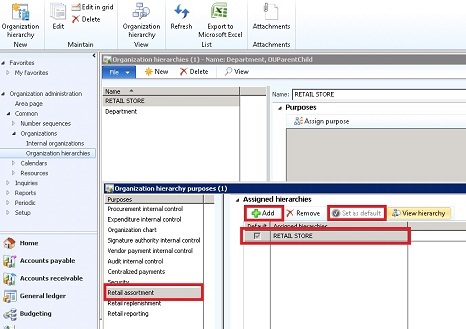 5- When step 4 has been completed, click the Retail Assortment menu on the left and follow the same process you executed in step 4. 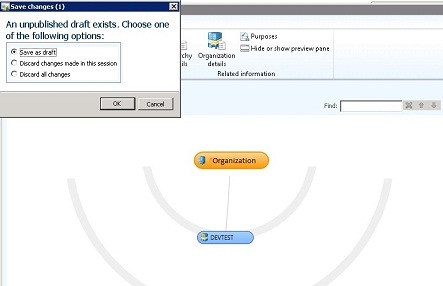 7- Then go to Organization Hierarchy and click the Organization Hierarchy view. When the Hierarchy Designer opens, click the Edit button. 9- The legal Entity (i.e. CEU) will appear in the Retail Store designer. 10- Click as Save as Draft. 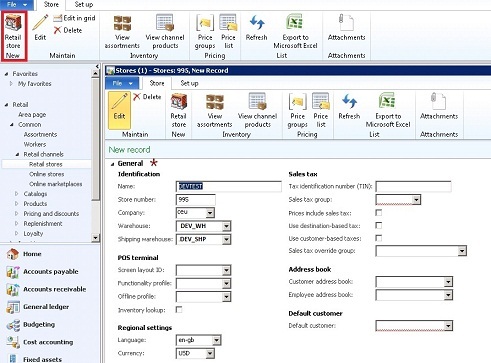 On the Save Changes windows choose “Save as draft” and click OK.
12- Click New Retail Store and fill the required fields. 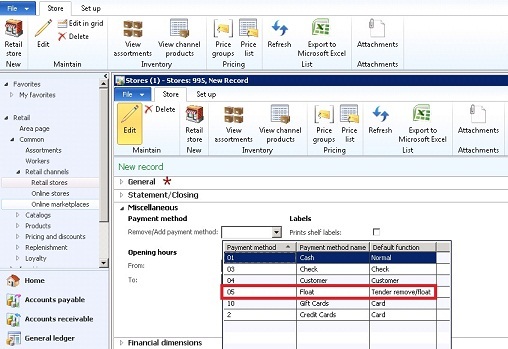 13- Go to the miscellaneous fast tab and make sure you have your payment methods. On this, for some reason in my environment, the Credit Card Payment method needed to be setup to 2 and not 02. 14- If all goes OK, you should see the following. 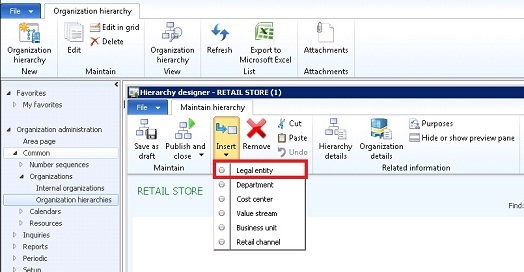 15- Now, go back to Hierarchies to add your new Retail Store to it under your organization. For this, click the Edit button and choose “Keep working on this draft” and click OK.
16- Click the Insert button and choose Retail Channel. 17- From the Retail Channel window choose your new retail store, and click OK.
18- If all is ok, you should see something similar to the picture below. 19- Save your new model as draft again. 20- In order to make the model “official” within AX, we need to publish it. Do this by clicking Publish and Close the Viewer. 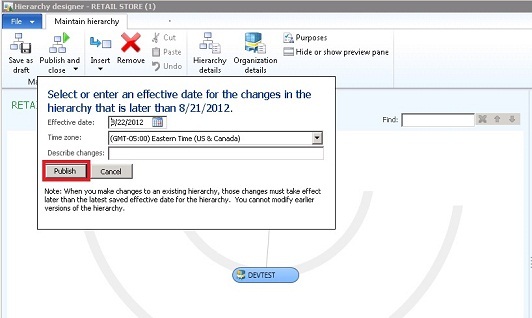 21- Select the effective date when you want this model to be active and click the Publish button. 22- You should see the following message. Once you have created your retail store(s), then you can create assortments and assign them to products and/or product groups to be publish into the retail channels. The assortment(s) will then be transferred to the AXRetailPOS database through an N-JOB. I will cover this portion in one of my next post. 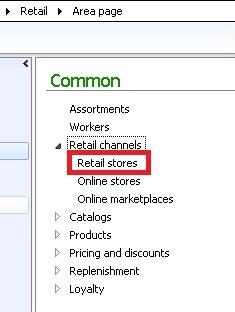 I have started my learning on 2012 Retail, I wish to do same. Thanks for reading my blog. AX 2012 Retail is fun. Thank you Very Much.it is possible to post you installation About Offline Retail Installation. I have created a new Table in AX 2012 , I want to have action job enabled for this Table. How I can do this , what methods and field I need to have in my new Table. 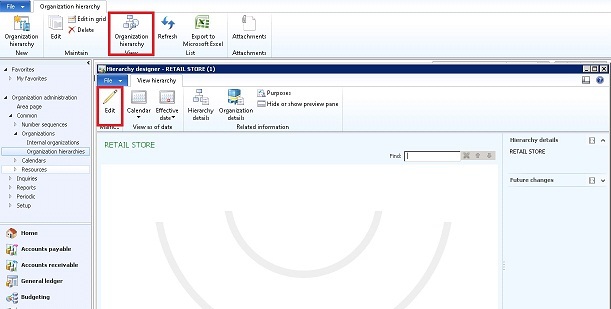 I have checked the Custtable Insert method , where it is being decided whether or not to insert data in retail Database. I'm not sure how to do this. I have worked only with existing tables in AX Retail. It would be great if you could share your experience if you find a way to do it.